This Spring, Summer and Fall on the farm has been like no other. 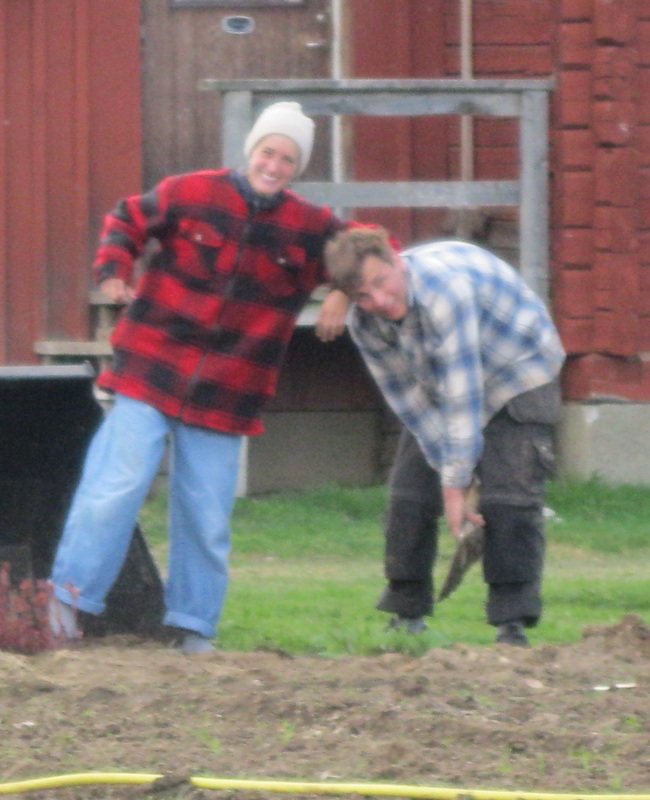 We never could have imagined the enormous progress we would make and how having the wwoofers and members of our family here would "fast forward" our efforts to beautify and complete the farm. The coming posts will chronicle the whirlwind that was May to October and in the process we hope you will come to know our dear friends, feel the miracles that took place, and rejoice with us in the blessings that came to us as a family. Gustav and Lauren Haddad creating the new perennial flower bed. The early days of May were cold and wet but they brought us our first-ever wwoofer from the U.S. and she was anything but chilly! Warm-hearted and willing to try anything, this cute girl who had two degrees from NYU under her belt already, was as fun as she was beautiful. She and Gustav addressed the formidable task of creating a new perennial flower bed at the front end of the vegetable garden near the storstuga. We wanted to bring the heritage peonies, miniature purple iris plants, and dazzling yellow lilies that had been down by the pump house up to where they could bloom for all to see at the entry to the farm, but we worried that they might not survive the move. Hand carried from their ancestral home in the far north of Sweden, they had been nursed along for four years and had only barely bloomed the previous season. Gustav decided to do a trial run in the transplanting department with the six lagging rhubarb plants that had been isolated in a patch of grass by the red currant bushes instead of being over lined up in "rhubarb row" that runs along the side of the weaving house. 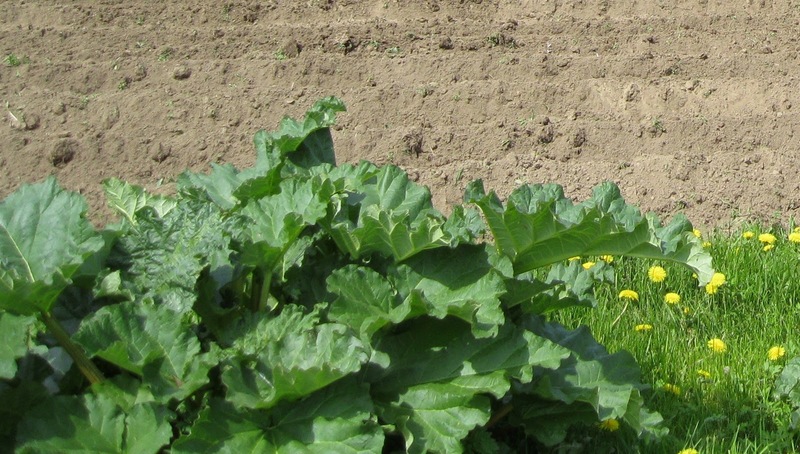 Of course we knew that rhubarb could survive just about anything and still live, but he figured it would give him an idea of what the soil was like and how to deal with the root balls in the best way. Moated and watered profusely, within just a few days the plants had taken hold and began to send out strong stems with their ruffled leaves that promised enough cobblers, pies and saft syrup to last through the coming year and beyond. Spurred on by his success, he measured out the area for the new bed, calculated where the plants should be placed, and cut the sod. Our clay filled soil needed a fair number of turns with the rototiller to loosen it up enough, and then it was time to bring the first peony. It seemed to go OK...lots of soil around it and gentle handling. Before we knew it, he and Lauren had all of them dug up and into the bucket on the front of the tractor, then down to the new bed where the they were snuggled into the waiting holes, flooded with water and filled in. What had started out as a blustery, windy morning (look at how Lauren is dressed in the first photo), turned into mild and almost balmy afternoon. It was perfect, a good job done and we were filled with hope. And did they make it? This picture was taken twelve days later when the first buds on the iris plants appeared. In fact they bloomed so profusely that we took some of the leftovers and put them in the ground in yet another new bed, beefed up with some yellow daisies. 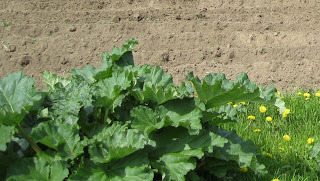 And here's a close-up of that test-run rhubarb plant, flourishing complete with dandelions! This picture was taken just over a month later. The irises had bloomed beautifully and then the buds on the peonies began to appear. Only a few days later we saw the lilies begin to swell at the ends of the stems. We were so excited and felt overwhelmed with happiness to see each flower arrive...so healthy, so sturdy and such a beautiful display. It was better than we ever could have hoped.